For all those people who are interested in the Eurovision Song Contest, here are the results for 2004. The 2004 Eurovision Song Contest was held at the Abdi Ipekci Stadium in Istanbul, Turkey. Presenters are Meltem Cumbul and Korhan Abay. This is the first Eurovision Song Contest to have a semi final and a final. The semi final was broadcast on Wednesday 12 May 2004, 2 hours long. The final was broadcast on Saturday 15 May 2004, 3 hours 10 minutes long. First Results appeared here at 23:15 UK on Saturday 15th May 2004. Serbia and Montenegro won the semi finals, Ukraine finished in 2nd place, Greece in 3rd place. Please click here for full 2004 details! (Pre Eurovision Night). This detail pages was this page until 15 May 2004. Surprise televoting spokesperson were Johnny Logan for Ireland and Esther Hart for the Netherlands, both previous finalist in Eurovision. 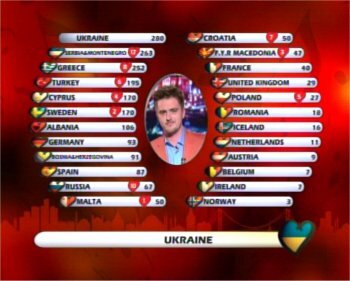 The winner was Ukraine. Serbia and Montenegro won the semi finals. For Background Details to the 2004 Eurovision Song Contest, please click here. For UK Selection Details, please click here. 469,240 Votes were cast by the UK for the Eurovision Final. Here are the predictions (by me) regarding the varies of Countries for 2005 contest (before anything else is known). Unconfirmed, the date for the Eurovision Song Contest 50th Contest Semi Final 2005 is Wednesday 18 May 2005 and the Final is on Saturday 21 May 2005. This date was given by Terry Wogan UK Commentator on the live final in 2004. The Final will be shown on a Saturday night, the Semi Final possibly being held on Wednesday. The Semi Final will be shown on a Wednesday night before Eurovision Final.